Part of our services here at PLL include providing much-needed baby and maternity items for families in need. These items are earned through our “Earn While You Learn” Program. Clients prepare themselves to be parents and learn life skills while earning points. They then “buy” essential items using their points. We need YOUR help to keep this room stocked with all the essentials. 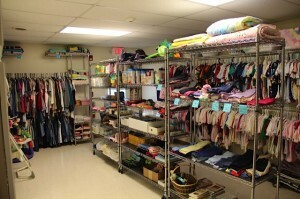 We gladly accept donations from the community but we do ask that the items be brand new or very gently used. Donations can be dropped off any time the center is open.